The Size You Need OMTBV7-W feed-through terminals come in ten sizes and are rated to 600V (800V IEC). 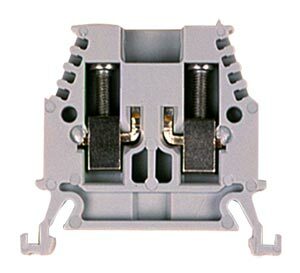 They accommodate a full range of wire sizes from 30 AWG to 3/0 AWG (0.5mm2 to 70mm2 wire cross section). Many "specialty" feed-through terminals are also available that provide multiple terminations or increase the density of connections. This reduces panel space and saves money. Super Reliable Connections The most important aspect of a terminal block is to join wires in a reliable connection. With OMTBV7-W terminals, a cone-shaped guide allows easy insertion of the wire into a nickel plated barrel. As tightening torque is applied to strong stainless steel screws, the wire is secured between a recessed contact pad and serrated current bar. This corrosion-resistant clamping mechanism provides excellent performance in the most demanding industrial conditions. 참고: End barrier not required for OMTBV7-W70.